Four intelligent humans are sent off in a rocket to be the first to visit the planet Mars. Everything goes according to plan...that is until they are on the planet where they are not welcome at all by the planets inhabitants. Ib Melchior (THE TIME TRAVELERS (1964) brings us a sci-fi adventure film in the supposedly incredible viewing experience 'cinemagic'. This was a technique involving hand drawn animation working alongside the live action footage. It was used mostly on the scenes when the crew are on Mars but unfortunately for Melchior it doesn't work very well. If it wasn't for the great looking bat-rat-spider creature attacking the crew later in the film this space adventure wouldn't have alot to keep you entertained. The dialogue though scientific in nature helps make the interactions between the characters more believable, but they do come across more as robots mainly due to the way it is delivered by the cast. The film is full of stock footage of the white house, pentagon and other notable buildings which is of course added into make this sci-fi film more realistic and (sarcasm warning) is not at all added into fill the meagre running time. 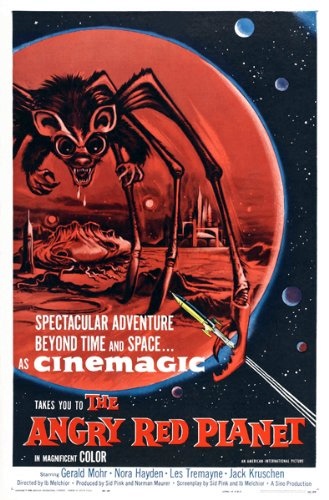 Put this film on with another 1950's B-movie to have an evening that will take you to the stars and back.